According to sociologists (=people who study the relationships between people living in groups), we are good at lying. As a species, we have developed a remarkable ability to deceive each other (= persuade each other that something false is true). Being able to say things that are not true can help with relationships, apparently, and helps us to work together as a community. This may sound strange, (surely lying is wrong? ), but when we think about it, most of us occasionally say things that are not completely true, and often for the best of reasons. This week, then, we’re looking at the language of lies – big lies and little lies, bad lies and good. Let’s start with those ‘innocent’ lies. White lies; are those lies that most of us tell in order to be polite or to stop someone from being upset when the truth is bad. People sometimes use the informal noun and verb fib to mean the same thing. 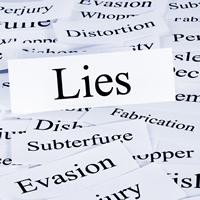 ‘Fib’ is defined in the Cambridge advanced Learner’s Dictionary as ‘a small lie that does not cause any harm’. The word is often used by children and the collocation is to ‘tell a fib’. Deceit (and deception) is the act of keeping the truth hidden, especially to get an advantage, and a person who is guilty of this can be described as deceitful. A slightly less strong word for ‘deceitful’ is the formal adjective disingenuous. Most dictionaries define it as being ‘slightly dishonest, or not speaking the complete truth’. A person who has been disingenuous may have told a half-truth, a statement which, as it sounds, is only partly true. Or they may be described, humorously, as being economical with the truth (= avoiding saying the true facts about a situation). There are a number of ways to say that someone is lying. If someone misleads you, they cause you to believe something that is not true: He has admitted misleading the police about his movements on the night of the murder. There are some more colourful phrases to express this. A person may be said to fabricate or concoct a story or excuse: She was late, and fabricated an excuse to avoid trouble. /He had concocted some story about working late at the office. They may also be said to spin a story/tale: He’d spun some tale about having to take time off work because his mother was ill. To feed someone a line is similar: She fed me a line about needing money for her sick brother. Meanwhile, if someone lies through their teeth, they say something that they know is completely false: He asked me how old I was and, lying through my teeth, I said ‘29’. Finally, if someone describes a story or explanation as a pack of lies, they mean it is completely false: The whole report was a pack of lies. A more formal way of saying this is a tissue of lies. Tanks a lot! Now I know that I can be disingenuous sometimes, but at least it doesn’t sound as tough as ‘dishonest’. These terms have helped to define myself better and therefore, I appreciate your making public this. As far as I know. We use word “lie” with article a/an or in plural meanwhile we use word “truth” with article the because truth is unique while lies are what we invent and can vary depend on our imagination. After this elegant definition of “disingenuous,” it’s worth noting that “ingenuous” is also a word, meaning “candid,” “open,” “frank,” or even “naive.” As is usually the case, the longer word is used in more formal or literary contexts. I am not a Liar, is that a lie? I hate big lies. Once I had to tell one & then life turned to hell!